J Renee is a brand that was created for women who love stylish footwear that is driven by the latest trends. It's an enormously versatile brand that has a look for most occasions, whether you're shopping for smart work pumps or you're in need of some chic holiday flats. The aesthetic of the brand is youthful and cool with a wide range of colours incorporated and plenty of use of different materials and prints, from monochromes through to metallics. 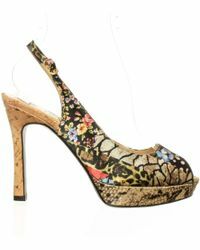 Shop the range of heels from the brand for cool vintage style peep toe pumps, elegant slingbacks and bow front designs. There are heels covered in nautical stripes, adorned with bold pastel colours and colourful florals, as well as glamorous embellishments.